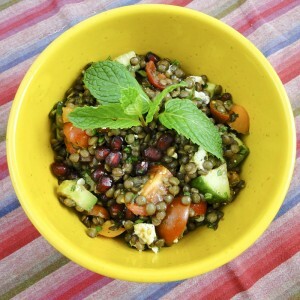 I first discovered maqluba, in Ottolenghi's Jerusalem cookbook. A maqluba is essentially a layered rice and vegetable cake that is cooked in a pot and inverted right before serving. Maqluba roughly translates to "upside down." After making my first maqluba, I was intrigued by the technique of layering vegetables and rice, and protein. I thought this technique could be reworked a bit, particularly with regard to the frying of the vegetables. In this recipe, I replace the fried vegetables with roasted and braised vegetables and skip the meat for a vegetarian dish. I think this revamped method adds to the flavor and healthfulness of the dish. Traditional maqluba uses some very earthy spices: turmeric, cinnamon, allspice and baharat. In this version, I stay with Middle Eastern spices, but uses citrus-like za'atar and sumac, with a little cumin for a lighter, brighter flavor. Once you master the maqluba technique, you can substitute an array of vegetables and spices to suit your taste. 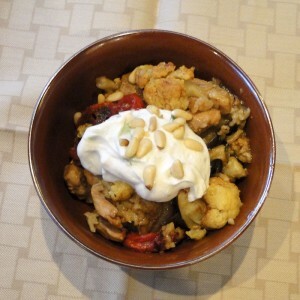 Traditional maqluba is topped with and nuts and served with yogurt. 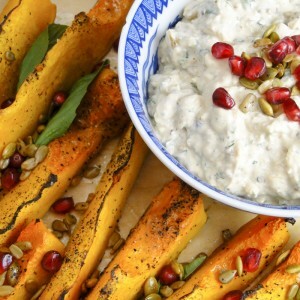 I use pine nuts and pomegranate seeds and serve my maqluba with Ottolenghi's burnt eggplant and yogurt sauce, which is really a version of baba ganoush. 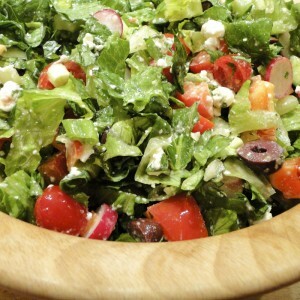 This recipe is vegetarian and gluten free. If you substitute olive oil for the butter it would also be vegan. Cook the maqluba in a 10-12" heavy bottomed pan, that is at least 5" deep. A 7-quart Le Creuset Dutch oven is perfect for this dish. Parchment paper is used to line the bottom of the pot. You can also line your roasting pans with parchment paper when you roast the vegetables to prevent them from sticking and reduce your cleanup. See my post on how to wash leeks. This dish takes a little labor and is more suited to a Sunday night family meal when you have a little time to put it together. Many of the steps can be done simultaneously. Rinse the rice and let it soak while you prepare the vegetables. Salt the eggplant and let it set while your braise the leeks. Slice the zucchini, eggplant and cut the cauliflower while the leeks are braising. Seed the pomegranates while the maqluba is cooking. Traditional maqluba is reconstructed by roasting the vegetables instead of frying them. Za'atar, sumac and cumin season the dish for a fresh take on this rice and vegetable upside-down torte. Heat oven to 425 degrees. Salt both sides of the eggplant slices and lay out on paper towels for about 30 minutes. The eggplant will bead up with water. Dry the eggplant off before layering. Rinse rice until water runs clear. Put rice in a bowl and cover with water and let sit while you prepare the vegetables. Trim the green parts from the leeks. You can leave about 1 inch of the pale green, but the remaining leek should be primarily white. Slice the leek lengthwise and place in a sink full of cool water. Wash the leeks vigorously, separating the leaves to remove all the dirt. Shake to remove water. Melt 2 T butter in a saute pan over medium high heat. Saute leeks cut side up for 3 minutes, turn over and saute for another 3 minutes cut side down. Add 1/2 cup of vegetable stock. Bring to a brief boil and reduce heat. Cook for 5 minutes until tender and most of the liquid has been absorbed. Remove from heat and set aside. Toss the zucchini strips with a little olive oil and season with salt and pepper. Spread out on a baking sheet. Do the same with the cauliflower. Dry the eggplant and brush with olive oil and season with salt and pepper. Roast all three vegetables in the oven. Roasting times will vary depending on the size of the vegetables. Flip the veggies half way through to roast both sides. Zucchini and cauliflower will take about 15 minutes, total roasting time. Eggplant will take about 20 minutes. Cut a circle of parchment to fit the bottom of your Dutch oven. Brush the bottom of the pan with a little melted butter. Lay the parchment on the bottom of the pan. Brush the paper and the sides of the pan with the remaining melted butter. Begin layering your maqluba, starting with the tomatoes. Arrange the tomatoes in an overlapping circle on the bottom of the pan. Sprinkle tomatoes with 1/2 t za'atar. Continue adding one layer of vegetables at a time, and sprinkling each layer with 1/2 t za'atar. Arrange the zucchini side-by-side on top of the tomatoes and sprinkle with 1/2 t za'atar. Put the cauliflower on top of the zucchini and sprinkle with 1/2 t za'atar. 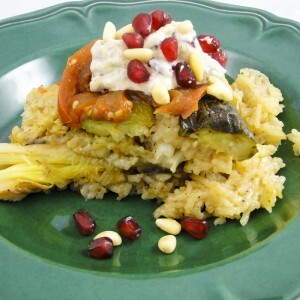 Arrange the eggplant on top of the cauliflower and sprinkle with za'atar. Finish with the leeks and a final sprinkling of 1/2 t za'atar. Drain rice and spread on top of the layered vegetables. Scatter the garlic on top of the rice. Using your hands, press down evenly on the rice. Add 1 t za'atar, 1/2 t sumac, 1 t cumin 1 t salt and 1/2 t crushed red peppers to 3 cups of broth. Stir to combine. Pour the broth over the rice. Using your hands, press down on the rice until the broth covers the rice. At first the rice may seem too dry, but if you keep pressing the broth will surface to the top. Now you are ready to cook the maqluba. Put the pot on a medium hot burner and heat until the liquid begins to boil. Reduce the heat to low, cover and cook for 30 minutes. Keep the lid on as the steam is necessary to cook the rice. Don't peek! After 30 minutes, turn off the heat and remove the lid briefly. Place a clean kitchen cloth over the top of the pot and immediately put the lid back on. Let the maqluba sit for 10 minutes. Now for the tricky part, inverting the maqluba. Remove the lid and place a serving dish on top of the pot. Quickly invert the pot and let the maqluba sit for 3 minutes. Gently pull the pot straight up to reveal the maqluba. Top with pine nuts and pomegranate seeds. Serve individual portions topped with lemon wedges and Greek yogurt or Burnt eggplant sauce.